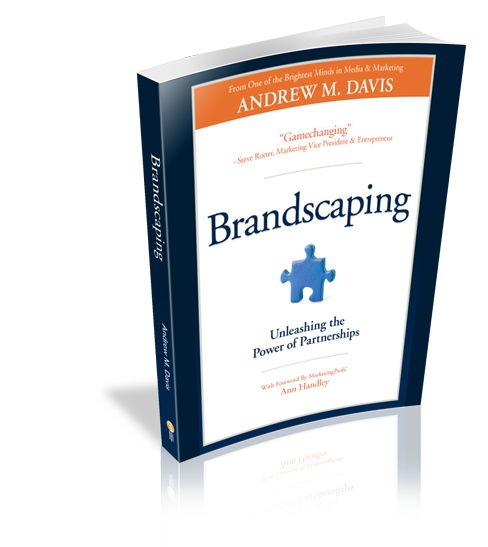 Andrew Davis, author of Brandscaping, brings personality to marketing. 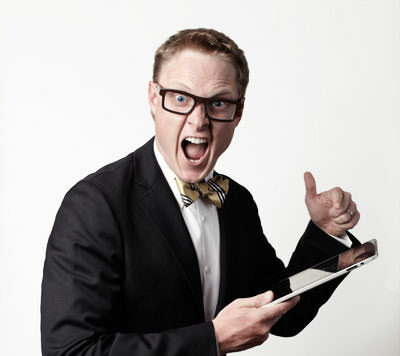 Andrew Davis is the guy you want on your marketing team. He’s smart, passionate, funny, and has an uncanny knack for nailing it. His book Brandscaping: Unleashing the Power of Partnerships captures the essential rules of modern digital marketing. And if you had to distill it down to just one idea, it would be that marketing isn’t for loners. These days, you have make some friends and try new things. And Andrew Davis is very good at identifying good partnerships and great marketing. In his book, he writes about large and small companies that are discovering new customers, simply by thinking beyond their traditional owned, earned, and, well, whatever campaigns. He is like your favorite coach who both applauds you for reaching a new personal best, but also suggests that you can do better. He deconstructs successful campaigns, admires the work, and then suggests clever ways to make it even better. He’s smart, nimble, and it comes through on every page of his book. But Andrew Davis is more than a writer. He’s also a surprisingly good speaker. When I met him this year, we were participating in a series of videos for Content Marketing Institute. At Content Marketing World 2013, Andrew delivered a presentation on Brandscaping: The Secret to Unlocking Bigger Content Marketing Budgets and Driving Faster Results, and was the highest rated presenter at the conference. Not bad, considering the marketing legends at the event. Despite his non-stop speaking schedule, Andrew found time to participate in an email interview with me. BUDDY SCALERA: First, can you tell me what your book Brandscaping is all about? 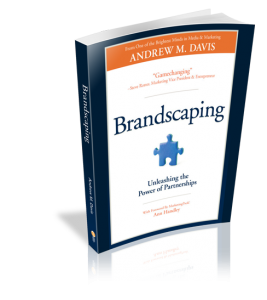 ANDREW DAVIS: Brandscaping is all about leveraging the audiences of others to more effectively and efficiently sell your products and services. Essentially the entire book asks you one question: who already has your next customer as their current customer? Thinking this way opens up tons of new opportunities to work together, creating content that both your audiences will find valuable. BUDDY: Who would want to read Brandscaping? ANDREW: Maybe it’s easier if I tell you who Brandscaping is NOT for. Brandscaping isn’t for lazy marketers or PR people. It’s not for the kind of person that’s looking for a simple how-to marketing book. It’s not for people just looking to do exactly what everyone else is doing in the hopes that they stand out. It’s not for people looking for the next viral success. It IS for smart marketers. It’s for people interested in treating their content as an asset and seeing the largest return on the marketing dollars. It’s for strategic thinkers. The book’s been out a year, and not a week goes by that I don’t get a phone call from someone who’s finished the book and feels energized with new ideas and opportunities. I’ve heard from solo-preneurs running consulting businesses, home construction contractors, and even Fortune 500 CMO’s. So, I guess Brandscaping is for anyone interested in finding the most efficient way to reach their audience and drive revenue. BUDDY: The word Brandscaping has a nice ring to it. How did you come up with the term? ANDREW: To be honest, I didn’t come up with the term. It actually has its roots in retail design. In the retail design world they refer to the environment in which your retail location and brand appears as a “brandscape.” I was introduced to the term by one of my coworkers at Tippingpoint Labs, Brett Virmalo. I loved the way it sounded and I loved the retail connotations. Before I knew it, I was using it all the time. To be honest, it’s not the best book title in the world. I can’t tell you how many manscaping jokes I’ve heard in the last 12 months. BUDDY: I met you at Content Marketing World, where you were the highest rated speaker. How did you get started in speaking and what has it meant to you as a marketer? ANDREW: I’m so honored to have received such high marks at an industry event packed with my mentors and peers. I’m excited to attend Content Marketing World for a fourth year in 2014. I started speaking in 2009. In fact, Joe Pulizzi, from the Content Marketing Institute was the first person to invite me to speak in public at a Custom Content Council meeting in New York City. If I remember correctly, only days before the event a scheduled speaker backed out and Joe asked if I wanted to fill-in. I was thrilled to have been invited. Before I left the event I was invited to speak at three other events. Since 2010, I’ve delivered 200 speeches, met thousands of amazing people and traveled hundreds of thousands of miles. It’s been a real thrill. As a marketer, speaking has allowed me to attend so many amazing events and learn from so many smart people. I’m not the kind of speaker that shows up, speaks, and leaves. I’ve learned amazing things from marketers in the siding industry or in financial services because I took the time to listen to their industry issues and see what works. I suggest that every single marketer go to an event that makes you uncomfortable in an industry you never considered relevant. You’ll learn more at those events than a hundred other events combined. BUDDY: You actually published Brandscaping through Content Marketing Institute. Why did you go with them as a publisher? Is there another book in the works for you? ANDREW: Joe Pulizzi and Pam Kozelka at CMI have been so supportive of my endeavors and when Joe invited me to write a book for his company in 2011, I was thrilled, excited and even nervous. Joe’s team is one I knew well, trusted emphatically, and had access to the thousands of marketers I believed would find my insight and experience helpful. Publishing with CMI and working with my editor, Lisa Murton Beets, helped make me a better writer, a smarter marketer, and a published author. I’m thrilled. There is another book in the works. I haven’t settled on a publisher. But I’m working on a book about how brilliant towns, cities, states and regions get rich by targeting a niche. The tentative title is Stake Your Claim. BUDDY: You will be the Keynote speaker at the upcoming Content Marketing World 2014 conference. What will you be talking about? ANDREW: At this year’s Content Marketing World, I plan on talking about how brilliant video storytellers create a sudden urge to act without even needing a call to action. It’s in it’s very early stages of being a presentation, but I’ll be testing it on audiences all over the world leading up to Content Marketing World, so I really hope it’s a great presentation. BUDDY: Back to the book…you review a series of case studies in each chapter. I was familiar with some of them, but others were new. How did you find all of these cases? Did you use services like HARO or did you tap your professional peer network? ANDREW: Many of the examples in the book come from years of passive research. Every single day I spend an hour reading online and listening to radio broadcasts or podcasts from around the world. I try to focus on only four or five big ideas every year and as I find new case studies, examples, or ideas I store them in Evernote. I’d been collecting ‘partnership’ examples for years when I started Brandscaping. Of course, some of the examples also came from personal contacts or even accounts we’d worked on at Tippingpoint Labs. BUDDY: One of the features of the book includes “what if” scenarios where you discuss the myriad of ways that a brand can exploit their potential. You’ve talked about taking it to the next stage by doing podcasts and blogs and more. What’s the response been to these what-if ideas that you documented? Have the brands you discussed ever taken your advice? Do they ever reach out to you to be a consultant? Are they generally pleased or have you experienced any backlash? BUDDY: There is a section about fractal marketing in your book where you explain how brands find their niche. Can you talk a little about this idea if fractal marketing and what it means to Brandscaping? ANDREW: In today’s online world, you can’t be everything to everyone. Which means, if you actually want to build a relevant relationship with a new audience you have to really understand them. This is where Fractal Marketing comes in. The online universe works the exact same way. Let’s say you target travelers (that’s the trunk of the tree.) Now, split the branches of the tree into business travelers and leisure travelers (these are very different audiences – even though they are travelers.) You can keep splitting up your audience (almost) to infinity. In the Brandscaping world, finding partners at every node on the tree allows you to be relevant to the audience you’re targeting without having to ‘find’ the audience and create content on your own. Fractal marketing allows you to find the best partners with the highest quality audience. WARNING: This is a hard concept to embrace, but one of the most powerful marketing concepts I’ve ever encountered. BUDDY: I’ve been thinking of brands that might be in a brandscape that’s either too small or not profitable enough, but you have shown that even niche categories like raising chickens at home can be brandscaped. Can you talk about how brands can use Brandscaping to explore the niche that they hope to occupy? ANDREW: Brandscaping allows you to limit your liability in any specific niche by leveraging the audiences of people already involved in the niche you’re targeting. So, if you want to get involved in a niche you’ve never targeted before, instead of just buying ads or barging in on their social platforms, calling a potential partner and working together to reach the audience is much more effective and efficient. CMW B2C Roundtable, part 2 from Content Marketing Institute on Vimeo. BUDDY: So I take it from your website that you are a consultant and speaker. What did you do prior to this? Work at an agency or at a corporation? ANDREW: Today, all I really do is travel the world speaking to a wide variety of marketers and publishers about the new media opportunities and how best to take advantage of them. Before that I ran a digital agency I co-founded called Tippingpoint Labs. I sold my share of the agency in 2012 and retired to pursue my writing and speaking which has been unbelievably fun. Before that, I worked in television and film production. I produced for NBC, CNN, MTV. I wrote for Charles Kuralt and spent two years working for the Muppets. I’ve had a really wonderful career. BUDDY: What sort of guidance would you give to a young or mid-level marketer? BUDDY: And related to that, what sort of guidance would you offer to senior-level marketers? ANDREW: If you’re a senior level marketer I expect you to have a clear and simple vision of how you believe the new media world works and how it actually drives revenue. The more time you spend clearly articulating, refining, and defining your vision – the more valuable you are to me (and to any brand in the marketplace.) Too many senior marketers spend too much time focusing on the tactics they want to employ instead of delivering a clear vision to the organization and showing how it’s driving revenue. BUDDY: I’m very interested in how content marketing is evolving, particularly visual content marketing. What sort of trends have you observed in the way brands have used visual elements in their content marketing? BUDDY: Are there brands out there that are doing a particularly good job using visual content in their marketing? If there are, what makes their visual approach effective? BUDDY: How can and/or should brandscapers use visual content? ANDREW: Check out how Mountain Dew and Ford have leveraged Devin Graham’s visual storytelling to build great inspirational content on his YouTube page…. BUDDY: Where can people get in touch with you? BUDDY: What’s next for you? This entry was posted in advertising, Authors, books, content strategy, creativity, Marketing, publishing and tagged brandscaping, Marketing by Buddy_Scalera. Bookmark the permalink.